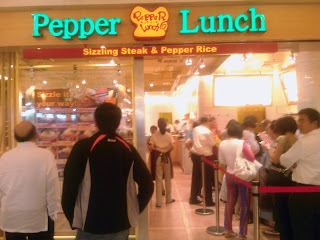 Jojo is celebrating today so he treated us for lunch in Power Plant Mall at Rockwell Center. 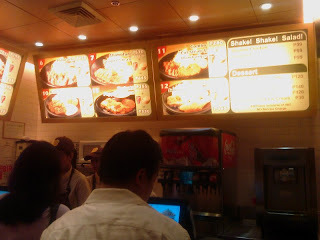 He brought us to this popular do-it-yourself fastfood steak house in Japan called Pepper Lunch. 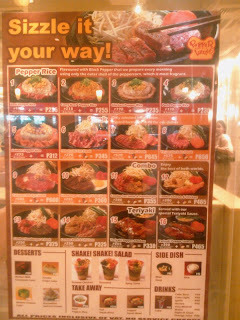 There were lots of items to choose from and as a steak and grilled meat lover myself, it made me drool on every item on the menu. At the end I chose Hitokuchi Cut Steak. 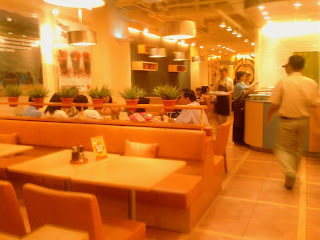 The ambience of the place is not so Japanese but more likely a fusion of oriental Asian styles. 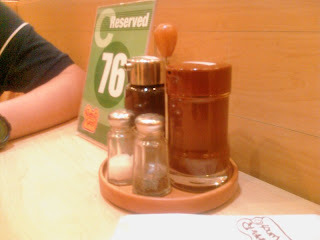 Before we ordered, we were given table number tags. The idea is great because customers know that after they paid in the counter they will have "guaranteed seats". 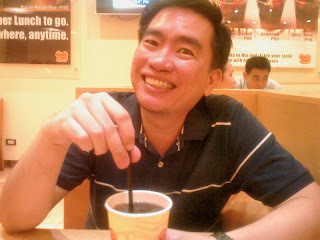 Again, today is Jojo's day that's why he's so happy and celebrating! So this is my Hitokuchi Cut Steak. Food here are served in an iron hot plate uncooked and unmixed. The concept? You have to cook it yourself! There are makuchi (honey brown sauce), karakuchi (garlic soy sauce) salt and pepper on the side so you can mix and match these according to your taste. There is a recommended way to cook your meal written on the paper surrounding your plate (remove it before eating). The experience? Well it was good. Similar to a shabu-shabu cook-it-yourself thing but the ingredients are fixed. I find the meat tender, juicy and just right. How about the taste? Well, you can't go wrong here and if you do, you shouldn't blame anyone else - you'll cook it yourself remember? hey, thanks for your post! 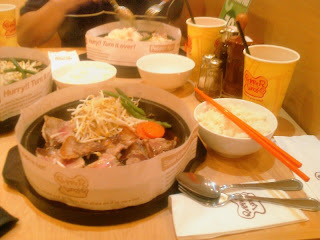 This is Cecile from Pepper Lunch. You should keep the paper ring around the plate so you don't burn yourself. thanks Cecile for reading the post!